The Wagner family acquired farmland in the Napa Valley following the 1906 earthquake in San Francisco. A winery was built in 1915 and Chuck Wagner's grandfather produced bulk wine until Prohibition was enacted. Four decades later, Chuck and his parents, Charlie and Loma, established Caymus Vineyards in 1972. Charlie named the winery after the original Mexican land grant, Rancho Caymus, which encompassed the area now known as Rutherford. The Wagners began making wine at Caymus with no formal education in winemaking, but with the help of fellow vintners such as Robert Stemmler and Randy Dunn, Caymus became a benchmark and one of the crown jewels of Napa Valley Cabernets. The Wagner family was able to branch out into other regions and varietals, and today, Belle Glos is one of four brands produced by the Wagner family (the Caymus umbrella also includes Mer Soleil and Conundrum). The wines have improved every year since the first releases in 2001. Chuck Wagner’s son, Joseph, handles the viticulture and winemaking for this label. The name (pronounced BELL GLOS) honors Joseph Wagner's grandmother, Loma Belle Glos. Three vineyard-designates include Taylor Lane Vineyard (Sonoma Coast), Las Alturas Vineyard (Santa Lucia Highlands) and Clark and Telephone Vineyard (Santa Maria Valley). 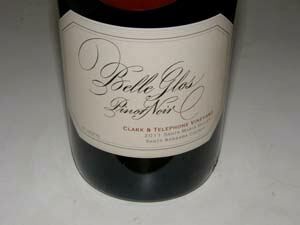 A fourth Pinot Noir, Belle Glos Meiomi is a value-priced wine from declassified juice ($26). The wines are distributed to fine wine retailers. 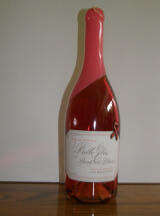 The bottles are amongst the most charming in the business, offering a long neck dipped in generous wax. The Belle Glos Pinot Noirs in early vintages (2002-2005) were big-styled wines with generous extraction, alcohol and oak, and plenty of tannins when young. The last couple of years have shown more restraint. The Gambit series of Pinot Noirs debuted in 2008 featuring no added sulfur. They were even more voluptuous than the regular bottlings. The wines have good retail distribution and are one of the most popular labels in restaurants, particularly the Meiomi bottling. The winery is not open for tastings.